Click on the image above for a larger size (4.5 mb). All of Sean Connery’s ties are solid. All of George Lazenby’s ties are solid if you don’t include Sir Hilary Bray’s tie that he borrows as part of a disguise. George Lazenby is the only Bond who does not wear a solid black tie. More than half of Roger Moore’s ties are solid. Roger Moore is the only Bond who wears striped ties. The widest ties are from the late 1970s while the narrowest ties are from both the 1960s and the 2010s. The 1980s featured the most balanced tie width, at around 3 1/2 inches or 9 cm. Licence to Kill is the only Bond film where James Bond does not wear an ordinary long necktie. Only Roger Moore and Pierce Brosnan wear boldly patterned ties. Nine of Pierce Brosnan’s ties include a combination of blue and brown/bronze/gold. That’s more than half of his ties. Costume designer Lindy Hemming loved dressing him in that combination. Every Bond actor wears at least one knitted tie. Three James Bonds wear the black knitted tie that Ian Fleming dressed James Bond in, though Pierce Brosnan’s knitted is wool instead of the silk that Fleming specified. *Notes on the infographic: Identifications and delineations have been omitted because I wanted the ties to speak for themselves. The same ties and very similar ties worn by one actor (such as Connery’s narrow navy grenadine ties that vary only slightly in width in the 1960s) are not repeated. Similar ties that are worn by different actors (such as the black repp ties worn with the naval uniforms) are repeated. Some patterns have been slightly scaled up to display better. I don’t see there being anything wrong with a tasteful stripe or even a subtle bold pattern on a silk long tie. They not that Bondian but if done tastefully i don’t see a problem with them. Bolder patterns are coming back into fashion. I don’t think that was the implication. Though he may not wear them beyond the office to draw less attention, it would be nice to see Bond wearing regimental ties pertaining to his service. I wasn’t inferring anything, I was simply making a statement as the most unpopular Bond ties are the striped and bolder patterned ties. The classic Bond tie is navy and solid. However, it would be helpful to knoq which tie goes to what movie at least, with link to article. Would really appriciate it! I think it’s better this way. The ties can speak for themselves and we don’t get any nasty Moore/Dalton/Craig prejudice. While I don’t want to add labels to the graphic, I’ve listed which ties are from which film in the text in the article. Fantastic graph, the level of detail is astonishing! It shows how many of Bond’s ties are a lot more than they seem at first glance and how even the more subtle ties are not plain or simple, its all about the details. I am curious about something, Matt. 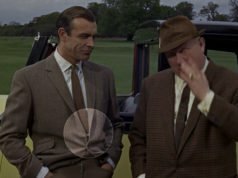 In your article about the Moonraker blazer you mention that the second tie that Bond wears with that garment is your least favorite of the series. I am curious if you still think so? I think it still is! Kudos Matt. A synopsis of truly awesome nerdiness! Wow, Matt, thanks for this clean neat presentation of all the neckties! This must have been a lot of work, even for a graphic designer. Whether the readers use it as a shopping list, a chance to take a close up look or as a fun trip down memory lane through all the films, you made something truly special to a lot of people. Thank you! I have to say, though many of them have their obvious concessions to the times, I could see myself wearing almost any of these ties. As it stands now I already have several of them in my collection already! I’m not wild about the one from the Live And Let Die train scene or the two worn in Venice in Moonraker. Apart from that I really do like them, and I agree that a striped tie is overdue for a comeback. Amazing work, as always Matt. Connery: Blue/Black Grenadine from Dr No etc. Dalton: None, maybe the bowties but that’s for later. Andrew, interesting that you said you liked Connery’s brown silk knit from Goldfinger but didn’t like Dalton’s brown silk knit from The Living Daylights. If anything the latter is more subtle and compatible – until I read on this blog that it was brown, I’d assumed it was black. You are right, that was actually pretty good. I personally think that Dalton’s best look was the tan suit in Tangier where he didn’t wear a tie, so maybe that is the reason why none of his ties stuck out for me. My second favourite is the gun club check but I couldn’t remember the tie he wore, thus not being able to recognise it in the graph. Thanks Dan for reminding me of it but it’s impossible for me to edit posts as of now. What did you think of my other picks? Yes, for the most part, great choices. I really quite like Moore’s brown tie with the criss-crossing brown vines. It’s not Bond but it’s very much something I would wear casually. Likewise I enjoy Brosnan’s red ties, especially his last blue and red one from Die Another Day. And of course, each and every knitted tie is brilliant and beautiful in its simplicity. I notice a necktie with the her majestys crest I believe? In what film and scene did he wear that in? The crested tie is part of the Sir Hilary Bray disguise in On Her Majesty’s Secret Service, but I do not know what the crest represents. Great article Matt. I realise body size and lapel width should be considered, but are you generally suggesting that 3 1/2 inch/9 cm is the ideal tie width? Yes, that’s about ideal for most people, with a lapel width the same. Do you, Mr.Matt Spaiser, disagree with any of these ties? I’m going to be populist for a change and say that the pink tie from DAF is Bonds necktie nadir. I don’t really get the dislike of the Moonraker striped tie worn in Venice. It’s no louder than some of Brosnan’s. Roger had about 5 shades of red tie and I agree that, in terms of width at least the 80’s ties were the best. Once again though, a fine piece of work. Impressive work, as usual, Matt. Congratulations. 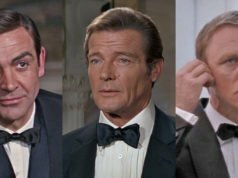 -Moore is the only Bond to have worn more than one black necktie in one movie (The Man with the Golden Gun : twice + another third time when he dressed just like his dummy), if I am not mistaken. Interesting. -Most of the bold patterned ties seen here look, as most of the commenters remarked it, not so bold and quite wearable today. I think it’s partly due to the fact we see such a little image of the pattern. The more you show of your tie, the bolder it will look. That’s why I think a bold patterned tie will always look better when worn with a 3-piece suit. There was a promotion picture of Brosnan wearing the navy and gold Sulka ‘tank scene’ tie with the navy birdseye 3- piece suit, and it looked much more understated than it does in the movie. The fact that he wore his jacket open for the whole scene didn’t help either. -I personnaly find a 8/8.5 cm width to be the perfect one. Yet I don’t have a regular, common physique, since I am very slim. The ‘tank’ tie I mentionned above I like the pattern, but I think it looked too wide on him. That’s why I think the tie width should be proportionate to one’s waist size, and nothing else. I ordered this tie’s replica and I received an almost 10 cm wide necktie. Much too wide for me, and also for Brosnan, who was probably a 31/32 waist size in Goldeneye. I would like to hear other people’s opinions about this. – The ties were made as close as possible to the true colours that they are. The red tie in The World Is Not Enough looks brighter in real life than it does on screen because we only see it at night in the film. 8,5 cm is currently considered as the “classic” width, wider than current fashion. If you are a slim person and your lapels are cut accordingly you should measure them and select the appropriate width. Matt has articles about how every part of the suit and tie should match. Almost regardless of the aforementioned: I wouldnt go wider than 8,5 cm if I were you. I wasnt wearing neckties (yet) in the nineties when Goldeneye came out, but I own an early 2000 Italian silk tie that is quite wide also, but I liked the way it looked so much. If I were in Matt’s position I would frequently pulling my hair from my head when it comes to deciding on the colors. Al the items from the current movies can be viewed in shops, but this counts less so for the older items. Apart from the colored lighting on set, they also use filters in front of the camera lense to manipulate the color balance and to create the desired atmosphere. In post production even more effort goes into making everything look good, nowadays even more so thanks to CGI. Then the film had to be made ready for distribution to: cinema, TV and dvd/blu-ray. Note how especially dark/contrasted the early Brosnan-Bonds look on Blu ray! I think they went over the edge with that. All this makes it very hard to discern a white shirt from a light ecru or cream colored shirt or to make out the exact shade and hue of red in a tie. Kudos to Matt who is probably looking very hard over and over before he decides what to write on his blog. Very nice work, Matt! Great all-in-one reference. And, I second David’s comments. It would be nice if Bond returned to see striped ties in Bond 25 – perhaps even just the terrific Royal Navy tie from L&LD. If I wanted to go back to the Sir Roger Moore era should I look into vintage sulka? I don’t know how much from Sulka would give you that look. In case anyone is unaware and interested, Turnbull & Asser has Pierce Brosnan’s Tomorrow Never Die, The World Is Not Enough, and Die Another Day ties listed on the website for sale. As you have written in several of your articles as to how costume designer Ms Lindy Hemming liked dressing up Mr Pierce Brosnan on combinations of light blue shirts with brown ties (with blue in them) with grey suits, which again had brownish weaves. For instance the Hamburg suit in TND or the Bilbao suit in TWINE. I gather that the brown weave in the grey suits brings out the brown in the ties. So, what would you say about pairing a grey suit, which does not have brown weaves, with a brown tie? Will it be a good combination? 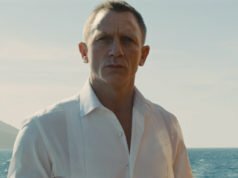 Considering that the shirt is also a light blue or sky blue like the Bond film shirts. A brown tie can possible work very well with a grey suit and blue shirt, but it depends on the exact colours of everything in question. I remember you said a awhile back when choosing a necktie two to three colors nothing too frantic. I’m stilln having a hard time choosing neckties that would go in the spirit of bond. There are some neckties that are beautiful but they look like they belong in a museum rather than around your neck (i.e. Stefano ricci). Would you happen to have any other rules when choosing a necktie say what not to choose when wearing say a gray or navy suit? Because I’m really stuck on this one. There are really no rules to ties.